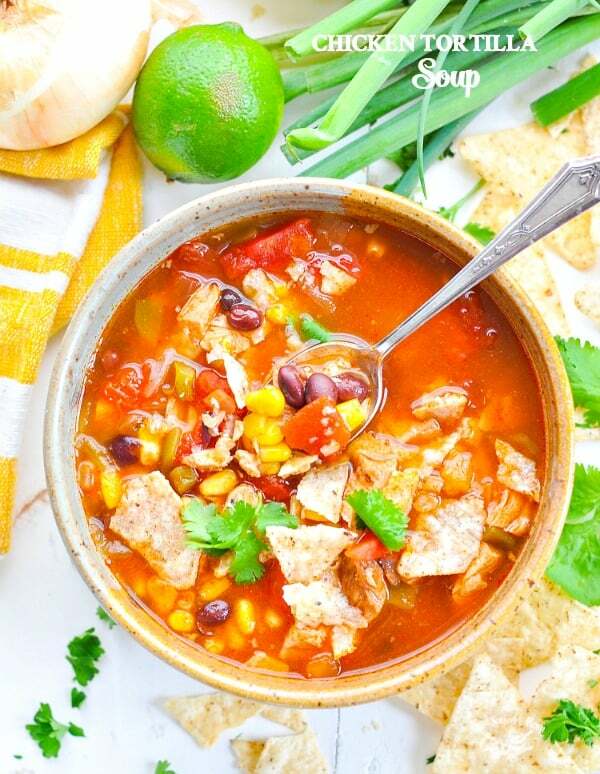 An easy and healthy Chicken Tortilla Soup that can be made in the Instant Pot (pressure cooker), in a Slow Cooker, or on the Stovetop! Since Cinco de Mayo is almost here, I have an easy and tasty Mexican-inspired recipe for you today. 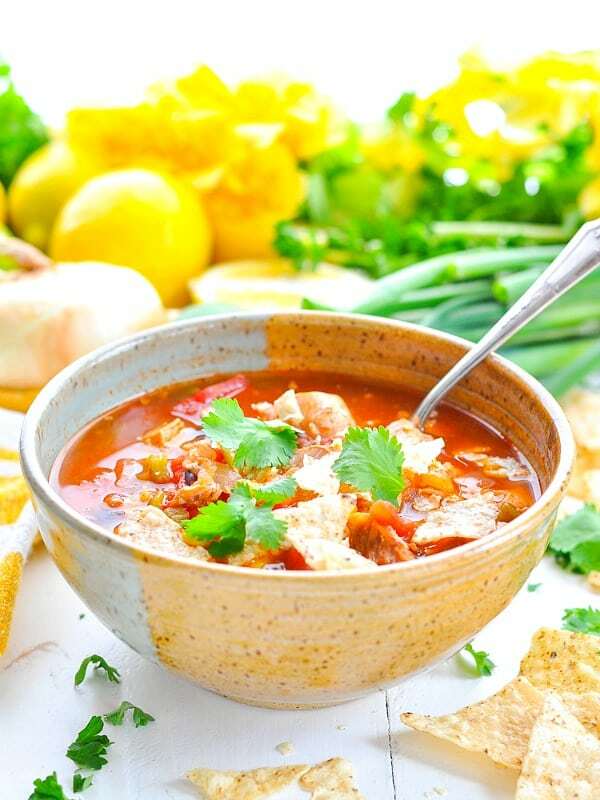 We love this Easy Chicken Tortilla Soup, which can be prepared in the Instant Pot (or pressure cooker), in a slow cooker, or on the stovetop! It’s full of flavor, but it’s also very healthy. Add as many (or as few) tortilla chips as you like…it’s completely customizable! 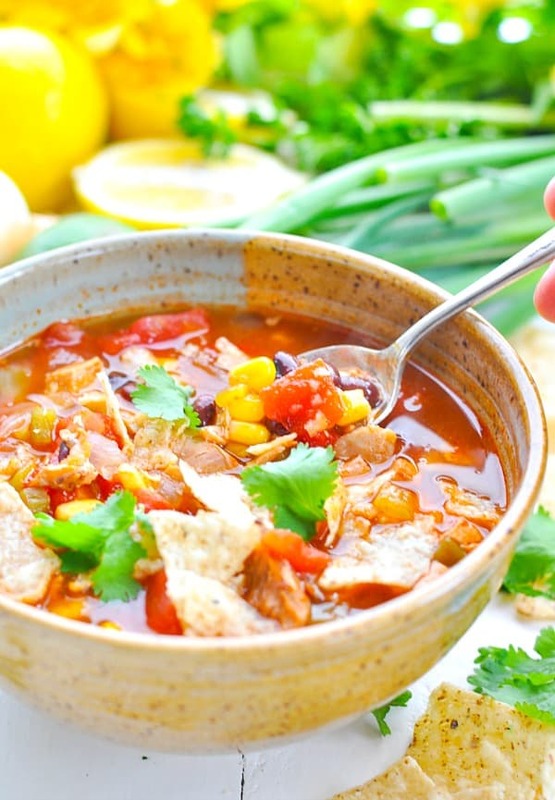 This recipe for Easy Chicken Tortilla Soup was originally posted in April, 2013. The photos were updated in April, 2018. Dairy-free? Just leave off the cheese on top. The rest of this soup is lean protein (chicken), beans, veggies, and broth. Vegetarian? 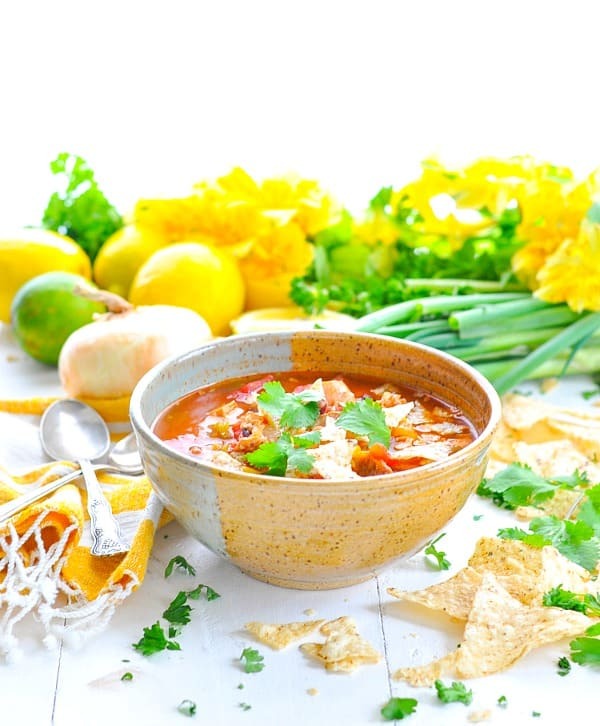 Skip the chicken in the “Easy Chicken Tortilla Soup,” throw in an extra can of beans, and use vegetable broth. It’s satisfying, it’s hearty, and it’s incredibly easy! I like to put all of the ingredients in my slow cooker and let it sit on my counter for the day. But, if you don’t have a Crock Pot (or if you just don’t have time to cook it low and slow), then no worries – it will be just as good in a pot on your stovetop. 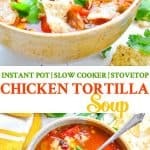 And now that I’ve finally jumped on the Instant Pot bandwagon, I can assure you that my favorite Chicken Tortilla Soup is even delicious in a pressure cooker! This particular recipe is pretty mild, since I’m serving my soup to young kids. If you want it spicier, add an extra tablespoon or so of taco seasoning, use spicy salsa, or even add some hot sauce at the end. Again, it’s totally flexible! I serve my Easy Chicken Tortilla Soup with cheese quesadillas on the side – it’s the Mexican version of tomato soup with grilled cheese (and it makes the kiddos very happy). 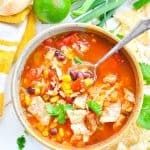 If you’ve tried this Easy Chicken Tortilla Soup or any other recipe on The Seasoned Mom then don’t forget to rate the recipe and leave me a comment below! You can also follow me on Facebook, Twitter, Instagram and Pinterest to see what I’m getting up to. Combine chicken broth, chicken, corn, diced tomatoes, black beans, green chilies, taco sauce, onion, garlic powder, cumin, and taco seasoning in slow cooker. Cook on low for 3-4 hours or on high for 1 ½ - 2 hours. If using uncooked chicken breasts, start by cutting the chicken into bite-sized pieces. Note: If you’re starting with cooked chicken, you can skip the first step and just add the chicken to the Instant Pot with the rest of the ingredients. Have leftovers? This soup freezes really well! This looks so delicious, and I love that it is done in a slow cooker…makes it so much better. Thanks for sharing this recipe! Hi, Jodee! It’s definitely a favorite in this house (especially with me, since it’s so easy!). I hope that you get to try it! Love tortilla soup. Will definitely give this a shot. Thanks. The WORST tortilla soup IMAGINABLE!!! BITTER & AWFUL. STOP! DO NOT WASTE YOUR TIME ON THIS. Wow this soup has so many delicious flavours and textures…great recipe!
. This is absolutely fantastic. I subbed refried beans for the whole beans. We have kids who “don’t like beans”, but would happily exist of refried bean burritos. Go figure! Isn’t it great? I’m so glad that you enjoyed it as much as we do! The refried beans are a nice idea! Wonderful! So glad that you enjoyed it! It was very tasty and easy. I used shredded rotisserie chicken to make it even easier. We could have used more broth, maybe a cup more. I’ll up the amount next time. Made this yesterday. The family raved about how good it is. Some of the comments were “you can make this twice a month” and there wasn’t enough leftovers. Thank you “Seasoned Mom” – you have a new follower. That’s awesome, Bobbi! Thanks so much for letting me know! Trying this today. Added some peppers for the flavor and the color. Smells delicious! Easy to make I was able to get the pot going while two kids under four tried to tear down the house around me. Now that is a recipe I can use. This is the second soup recipe I’ve tried from you in the last week. The first one was leftover turkey and wild rice soup which was very tasty. This recipe is even easier. I originally started with a healthy chicken tortilla soup recipe but it didn’t include corn or many things I look for in this type of soup. Yours looked better and it’s currektjy in the slow cooker. I did sub fifer roasted corn and fire roasted chopped tomatoes with green chilles. I hope it turns out good. Thanks so much, Alex! You can’t beat soup at this time of year. I hope that you enjoyed it! I have been wanting to try a chicken tortilla soup recipe for quite some time now. I stumbled across this one and thought it sounded delicious. So, I tried it and I don’t need any other recipe! I loved it! Thank you so much for sharing this recipe! Yay! That’s the best! So glad that it was a hit! This was awesome!! My entire family loved it and they are very picky. I would love more recipes. That’s wonderful, Mary! Thanks for letting me know! I hope that you get to try some of the other recipes on my blog, too! Sooo yummy… easy to make even in pot on stove… used Costco rotisserie chicken , a bit more vegetable broth, and fire roasted diced tomatos w/green chilis and some salsa tomatoes and for me the spice levels weee perfect. Great recipe… I two would give it 5 stars if the site would let me! Looking forward to leftovers of it tomorrow night too! Great! I’m so glad that you enjoyed it on the stovetop, Diana! Thanks for your suggestions! I was thinking about ways to use the leftover turkey from Thanksgiving and my daughter suggested I make a tortilla soup instead of the usual turkey noodle. This recipe was so easy to throw together in the crockpot and since members of the family were late getting home from work, the crockpot kept it warm until we were all ready to sit down together. It’s great because most all the ingredients were things I typically keep on hand. Everyone raved about it! I’m going to make this tonight. Had a couple f questions: I don’t have a can of green chilis – how many fresh ones should I sub in? Will it make it to spicy? Also, don’t have taco seasoning – any suggestions for sub? Thank you! I’d sub in maybe 1 or 2. It’s a small can, so it shouldn’t take much. I don’t know if it will make it too spicy. Definitely remove the seeds from the chilis, which will help to keep it mild. Boom chacka a lacka….. i had cooked chicken yesterday to make a batch of chicken broth….. So when i found your recipe i knew it would be what’s for supper… i can’t wait! Wonderful! Thanks, Cathy! I bet it was delicious with that homemade broth! I made and it was DELICIOUS!! Even my picky eater enjoyed it. I live in the UK and can not get taco sauce or green chilies. I made using mild salsa in place of both. This recipe is a keeper. Thanks! Great recipe. I added a 1/2 package of cream cheese and some Mexican blend shredded cheese to make a creamier version. Since I don’t like black beans, I substituted kidney beans. Love the recipe. Flavor is spot on. This is sooooooo good and a breeze to make. I’ve made it once and I’m currently making it right now. Using cooked rotesserie chicken makes this even faster to prepare. Yummy! Thanks for sharing! This soup was delicious. I only used half the chicken and it was perfect. I like more broth in the soup. I used the Instapot and it worked out very well. I used sour cream and grated cheese for toppings. You can adjust the hotness with buying either the mild or the medium taco sauce. I’ve made this recipe many times and my husband and I LOVE it. I just did the instant pot variation with uncooked chicken and it was also delicious! Wonderful recipe!